Last night, a packed house at Dartford BJJenjoyed a superb workshop on the half-guard with the incomparable Marc Walder it may be hard to imagine Kent as a hotbed of fine Brazilian Jiu Jitsu, but believe it! The club is affiliated with the Marc Walder BJJ Team and we are lucky enough to enjoy quarterly seminars with the maestro. The evening included a progression of techniques from the half-guard. We warmed up with moving from the most disadvantageous position (from the bottom point of view) – flat on back, arms exposed – to a side clinch with shoulders parallel to the opponent’s hips. Once we’d started to get the hang of moving from a poor position to one where we could work, we drilled the ‘old school’ sweep followed by taking the back for an RNC where the opponent sprawls the leg to counter the sweep. We also examined the scenario where an opponent has nearly progressed to mount; from the bottom position the hips are facing away from the opponent. We practiced two options from this position. Firstly, an elbow-to-knee escape to switch the hips to face the opponent in order to frame up and prepare to work as in the previous drills. Secondly, a sweep out the ‘back door’, shoulder shrugging under the opponent. It's all smiles on the mats! While I believe the technique we’re taught by Marc (not to mention Coach Birkett) is superb, as ever, what stands out in his seminars is his philosophical approach to the mats. 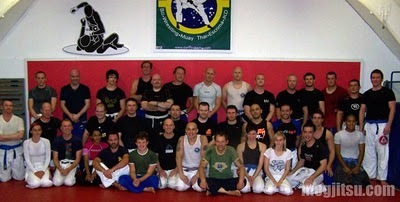 Marc’s seminars regularly reference the importance of 50% offence and 50% defence. Marc demonstrated this principle through our half-guard work, but underpinning this principle is the need to ‘let go’ of fear and ego. In other words, only by taking risks or by, ‘holding the cat by its tail’, can we hope to progress and overcome the barriers we put in front of ourselves. The seminar came to a happy conclusion with a promotion to purple; marvelous to see and well deserved.